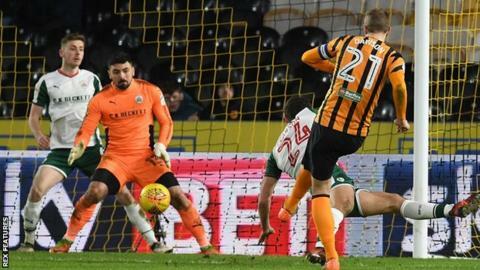 Michael Dawson salvaged a point for Hull City in their game against fellow Championship strugglers Barnsley. Dawson was in the right place to volley home from a corner to deny Barnsley a second away win in four days. Striker Oli McBurnie had headed the visitors in front from Brad Potts' cross - his fourth goal in four games. Barnsley centre-back Adam Jackson was stretchered off after a collision with Jon Toral which caused a lengthy stoppage at the end of the first half. The draw left the two sides 20th and 21st in the table, with Hull three points clear of the relegation zone - and one place and one point above Jose Morais' Tykes. Both sides went into the game looking to achieve back-to-back wins for the first time this season and after a couple of Hull half-chances, it was Barnsley who went in front when McBurnie was left unmarked to give Allan McGregor no chance. The incident involving Toral and Jackson - who suffered a knee injury against Hull in October which put him out for four months - saw both players have to go off, with the Barnsley defender regaining consciousness after being taken off the pitch. After the hold-up, it was Hull who emerged the stronger side in the second half, with a header from Angus MacDonald, playing against his former club, kept out by keeper Nick Townsend, who also saved from Jarrod Bowen and Nouha Dicko, but he could do nothing with Dawson's effort, the defender's first goal since December. "We were looking for all three points. We didn't reach the heights we reached on Friday in the first half. "We've gifted them a goal and they've had something to hang onto. They've put everyone behind the ball and it's up to us to break them down. "We've had enough opportunities in and around the box - we've had 17 shots on goal - but it was captain Dawson who's scored the all-important goal." "We came for three points. We played a very good first half and were unlucky to lose one of our central defenders. For that reason we did a substitution we didn't want to so early. "But we kept good balance. In the first half we created a lot of chances. We had a lot of good situations to score. "It was a fantastic goal and a creative situation that gave us the lead in the game and for that reason we really deserved our advantage." Match ends, Hull City 1, Barnsley 1. Second Half ends, Hull City 1, Barnsley 1. Attempt saved. Fraizer Campbell (Hull City) left footed shot from the left side of the six yard box is saved in the centre of the goal. Fraizer Campbell (Hull City) is shown the yellow card for a bad foul. Attempt blocked. Jarrod Bowen (Hull City) left footed shot from outside the box is blocked. Assisted by Kamil Grosicki. Substitution, Barnsley. George Moncur replaces Oliver McBurnie. Corner, Hull City. Conceded by Nick Townsend. Attempt saved. Sebastian Larsson (Hull City) right footed shot from outside the box is saved in the top left corner. Fraizer Campbell (Hull City) wins a free kick in the attacking half. Foul by Dimitri Kevin Cavare (Barnsley). Attempt missed. Ola Aina (Hull City) right footed shot from outside the box is too high. Assisted by Fraizer Campbell. Goal! Hull City 1, Barnsley 1. Michael Dawson (Hull City) right footed shot from the centre of the box to the bottom left corner. Assisted by Will Keane following a corner. Corner, Hull City. Conceded by Andy Yiadom. Dimitri Kevin Cavare (Barnsley) is shown the yellow card for a bad foul. Substitution, Hull City. Fraizer Campbell replaces Nouha Dicko. Attempt missed. Brad Potts (Barnsley) right footed shot from outside the box misses to the left following a set piece situation. Allan McGregor (Hull City) is shown the yellow card for a bad foul. Foul by Allan McGregor (Hull City). Kieffer Moore (Barnsley) wins a free kick on the right wing. Attempt missed. Jackson Irvine (Hull City) right footed shot from outside the box is high and wide to the right. Assisted by Jarrod Bowen. Attempt missed. Will Keane (Hull City) header from the centre of the box is close, but misses to the right. Assisted by Jarrod Bowen. Attempt saved. Nouha Dicko (Hull City) right footed shot from outside the box is saved in the centre of the goal. Assisted by Max Clark with a cross. Offside, Barnsley. Brad Potts tries a through ball, but Kieffer Moore is caught offside. Substitution, Hull City. Kamil Grosicki replaces Adama Diomande. Substitution, Barnsley. Andy Yiadom replaces Mamadou Thiam. Attempt saved. Jarrod Bowen (Hull City) header from the centre of the box is saved in the bottom left corner. Assisted by Max Clark with a cross. Kieffer Moore (Barnsley) wins a free kick in the attacking half. Attempt blocked. Ola Aina (Hull City) right footed shot from outside the box is blocked. Attempt blocked. Angus MacDonald (Hull City) header from the left side of the six yard box is blocked. Assisted by Jarrod Bowen with a cross.